As you can probably tell from the trailer, the action scenes are probably the best highlight to this film. At times it also get pretty gruesome, which only serves to ground this movie a little bit, and make some scenes seem more real. I actually appreciated the fact that Jesse Eisenberg's character didn't just walk away from a huge fight scene with only a minor scratch. He also does a decent job of giving you dry, satirical humor while still displaying some acting range in the serious moments of the film. John Leguizamo was probably one of the funniest characters, even though he had a smaller supporting role. The entire movie banks on two factors: action and comedy. The comedy, at times, felt a little forced. The few times it was funny, you'll get a nice chuckle here or there. For the majority of the movie, I felt like I was stuck in "pre-chuckle" mode. (A "pre-chuckle" is when you're smiling, getting ready for a laugh, but only a quick exhale through your nose comes out.) Along with that, the action scenes felt discombobulated. Eisenberg just appears visually awkward in fight scenes. His character is made out to be some type of lethal weapon. However, one minute he's unbelievably invincible, and then the next he's getting hurt, or doing really dumb things. The villains that he has to face, called the "assets" were also a disappointment because none of them had any of the "unique" traits that they were supposed to have. The only one that had a unique trait was "The Laugher" (played by Walton Goggins) and even he was a weak villain. All of the villains just seemed like petty henchmen that easily get disposed of in the movies. If you were expecting Kristen Stewart to break out and display some serious acting range....keep waiting. 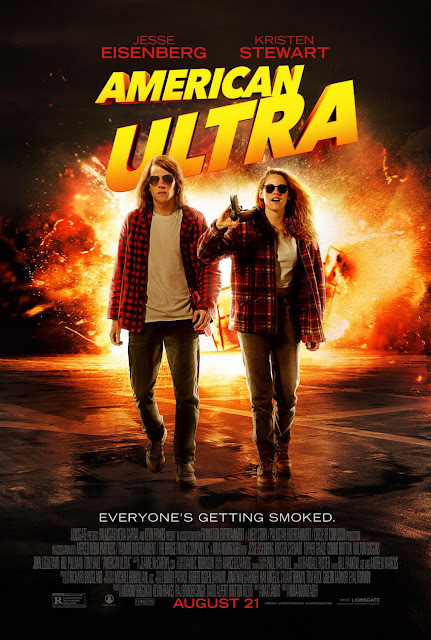 You could easily sum up American Ultra as The Bourne Identity + Half Baked + The Equalizer's ending scene. Most of the things that this movie tried to excel at, just didn't hit, in my opinion. I'm sure some people may find this film somewhat funny, but I'm almost positive that the majority will agree that it's absolutely not worth your time or money in the theaters. You know what, this is a movie that you watch when it comes on TBS. As a matter of fact, it's not "TBS Very Funny", it's only "TBS funny"... but don't be surprised if you change the channel the moment the first commercial comes on.